Hello, and a very happy Bank Holiday Monday to you all! I could certainly get used to these three-day weekends. Despite having spent the majority of my weekend indoors giving our house a dust, clean and decor sesh – today I tackled our fish tank and the garden! – I’m really feeling quite content after a few days away from the Internet and generally away from the outdoor world. It’s a hermit life for me! 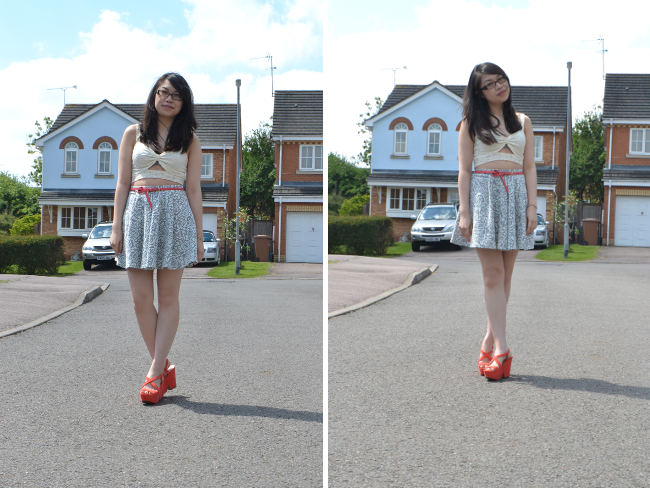 Cream lace bralet, Unlabelled sample sale garment; Cream Jacquard print skater skirt, Miss Selfridge; Belt, c/o F&F at Tesco; TRF wedges, Zara. First things first — I got my hair chopped off! Last week I impulsively booked an appointment at my hairdresser’s and by 11am on Saturday morning, I left the salon with this midi length style, inspired wholly by Anna. What do we all think?! I’m absolutely in love with it, it’s refreshingly light and makes hair-wash time so much easier. Now onto the outfit… Last Friday saw the first of our work sample sales since we moved offices. Sample sales are pretty good fun for picking up a bargain or two, and this time round, I picked up some skirts (including the one I’m wearing in this post – less than a tenth of its’ actual selling price) and this adorable cream lace bralet. I really feel like this season, my style has grown into itself. Ask any one of my friends and they’ll be able to string some words to describe my style — cutesy, girly, little dresses, not-much colour… But recently I’ve been much more into taking my prints and polka dots to the next level, dabbling in wearing colour and taking a little step away from my go-to collars and dresses. This cream lace bralet is completely unlabelled – sorry about that! – I am seriously in love with the cut-out front, and will probably team this with a light knit or something if I was to wear it in the day. I’m going to wear it with this patterned skirt and my Zara TRF wedges for a friend’s 22nd birthday celebrations next week. So excited to celebrate with him: it marks almost eleven years of our friendship!